The Scoot and Ride Highway Baby is a 2-in-1 ride-on vehicle for children up to 3 years old, or weighing less than 20 kg. When you push a button and twist the frame you can smoothly make the desired riding style. 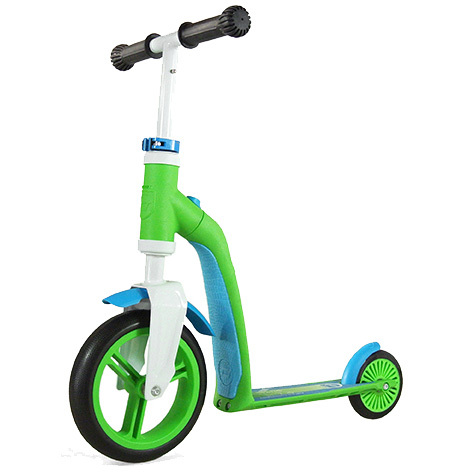 Children can either ride on it as a push scooter or a balance bike. Kids can sprint around their area with the Highway Baby using it as a scooter or as a balance bike to help them prepare for bigger models. If your child chooses to ride in scooter mode, a quick push of a button lets the bike be converted into a scooter! This colourful scooter and bicycle combination is one of the lightest in its class and is manufactured to a tough design. The soft seat provides good grip and in conjunction with the adjustable height handle ensures a relaxed and ergonomic sitting position. Rockboard Plus also has a range of other scooter models to suit children of all ages and even adults. The baby range comes in a variety of colours not only green and blue! Please tell us what you think of the Rockboard Plus Scoot and Ride Highway Baby Bike. 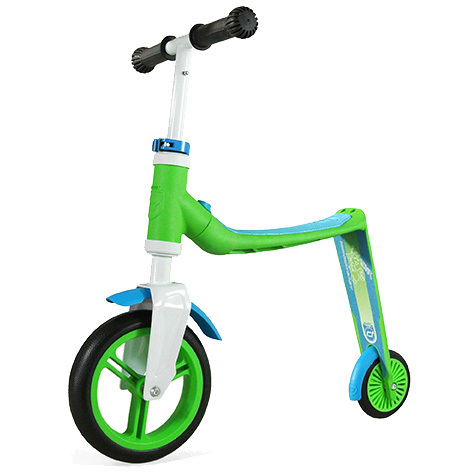 A very versatile balance bike which can change into a scooter. Great to keep the kids fit and active, easily converted, well made and strong and bright fantastic colours. You can even get them for the big kids in the family!